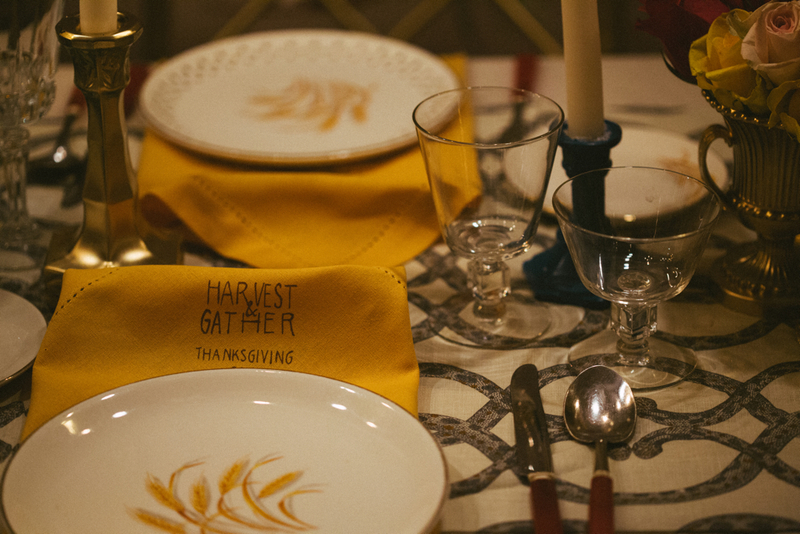 Gold, grains and games… it was an elegant Thanksgiving dinner to remember! The cloth napkins were a gift for the guests. They featured a custom illustration of a cornucopia and hand lettering of the menu. Guests found their seats by identifying their hand calligraphed names on custom wreaths, which were their parting gifts at the end of the evening. Am I more famous than Botticelli? Our entertainment for the evening was trying to ascertain whose names we had on our foreheads. What happens when an archivist and an art critic are in your midst? You might end up flailing (ie: failing) to guess Frans Hals the Elder or Borromini. You might feel inspired to read more about Dutch portrait painting and Italian architecture. Either way, you’ll remember the meal, the company and the event. Venue: Private apartment above the BrilloBox. Food & Drinks by Quelcy. *Harvest & Gather is a bespoke event design collaboration between floral designer/painter Thommy Conroy and myself.